Watch this pup miraculously cheat death on a rally stage. 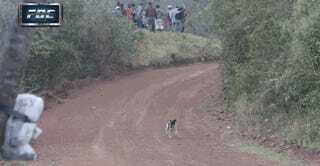 A dog running on a live stage in Bolivia’s Rally De Santa Cruz this weekend was spared when an oncoming Mitsubishi Lancer Evolution passed overhead on a jump. It’s a good thing the Lancer Evolution making that jump flew faster than the dog could run. Now that’s a lucky dog, folks.